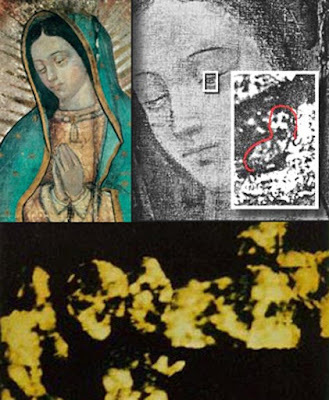 Interlocutor: There is a mystery that has intrigued to many people, it has to do with the figures that are inserted in the eyes of the Virgin of Guadalupe, a painting located in the Basilica of Guadalupe, Mexico. According to several specialists, men of science and even ophthalmologists who have inspected the cloth, in the painting they could see reflected in both eyes the precise location of images that would be reflected in a human eye, some figures that have been analyzed extensively and they seem to correspond to the form and size of human images located in front of the painting. Ruanel: Those who examined the cloth saw, on one hand, what they wanted to see, and on the other hand they have been influenced by the spirits of error. Interlocutor: Concretely, How do the spirits of error do to influence those who examined the cloth? Ruanel: The spirits of error simply put in their body of Ideas or Causal body, images or pictorial representations as well as false theories that they later on the investigators transmit as if they came from their own deductions. Interlocutor: But then in that painting there is nothing out of the ordinary? Ruanel: No, not at all, it is only an ordinary painting, where there is no physical phenomenon. Interlocutor: Is everything a hoax? Ruanel: There was no bad faith from the investigators, but their exaggerated gullibility has allowed that they be deceived by the spirits of error. Interlocutor: Can the spirits of error modify the cloth a little so that some figures appear? Ruanel: Yes, of course, making focus... The spirits of error perceive the doubts of the investigator and they take advantage of them developing his imagination and they make him see things that in fact don't exist. Interlocutor: Is it something similar to what happened to some Egyptologists who said the Great Pyramid could reflect or represent the future of mankind? I ask it because we know that the future cannot be foreseen and therefore all that is said on this is nothing more than a fantasy. This entry was posted at Monday, September 07, 2009 and is filed under Mysteries and Enigmas . You can follow any responses to this entry through the .